Glycogen is a large polymer of glucose molecules and is an efficient form for storage. Storing glycogen instead of the individual glucose molecules allows more storage without substantial modification of the cell’s osmotic pressure. [ref]Since osmotic pressure depends on the number of molecules in a solvent. See the discussion of osmosis and related possible danger for cells in the section on water. [/ref] All the body’s cells can store small amounts of glycogen, but the champions are the liver (5-8% of its weight) and the muscles (1-3%). Proteins are partially broken down in the stomach by the enzyme pepsin, important because it is capable of breaking down the protein collagen in the connective tissue of meat. This enzyme prefers a pH of 2.0-3.0, which is maintained by hydrochloric acid secreted at pH 0.8 by gastric glands in the stomach. When the resulting chyme passes into the small intestine, the pancreas excretes sodium bicarbonate to lower the acidity. 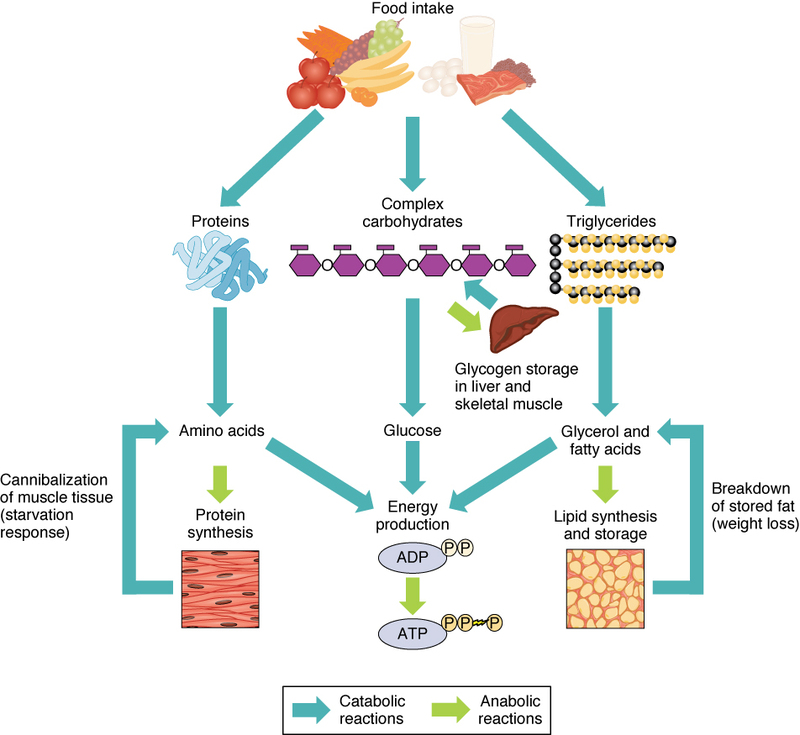 As in the case of carbohydrates, the pancreas contributes enzymes, pancreatic proteolytic enzymes or proteases, to the small intestine to continue the breakdown of polypeptides into amino acids, although most remain as relatively small di- or tripeptides. Finally, inside the cytosol of enterocytes[ref]Columnar epithelial cells, i.e., cylindrical cells on the intestinal wall, whose large surface area facilitates the transfer of molecules from the intestine. [/ref] on the intestinal wall, various peptidases break down what is left into single amino acids which then pass into the blood. These are carried to the cells to be used as raw materials for the construction of new proteins in ribosomes. Any remaining peptides may cause serious problems. Inside the intestinal membrane, the FFAs are re-synthesized into triglycerides. The triglycerides cholesterol, phospholipids and some apoprotein B (about 9% phospholipids, 3% cholesterol and 1% apoprotein B) are packaged into tiny (0.08-0.6 microns) phospholipid vesicles called chylomicrons whic leave the intestinal cells. They are too big for capillaries but can flow via lacteals into the lymphatic system. [ref]See the chapter on the lymphatic system. [/ref] The chylomicrons transport the fats and cholesterol through the aqueous lymph and then into the venous blood via the thoracic duct. From the blood, they are stored either in the liver or in adipose tissue. The liver stores a large quantity of fatty acids, but uses only a small part of these for its own energy requirements. So when carbohydrate stores (including glycogen) are low, great use is made of fats for energy. But, due to lack of intermediary substances, the Krebs cycle slows down. Excess acetyl-CoA accumulates in the liver where it is combined in pairs to form acetoacetic acid which is then carried by the blood to other cells. Some of it is converted to β-hydroxybutyrate and acetone, large quantities of which can be transported rapidly to cells. [ref]Differences between Guyton and Hall and Openstax about the order of these two processes. Which came first, acetoacetic acid or β-hydroxybutyrate and acetone? The end result is the same. [/ref] These two substances plus acetoacetic acid are collectively referred to as ketone bodies and their synthesis from fats is called ketogenesis. On arriving in cells, all three are converted back into acetyl-CoA, which enters the Krebs cycle. This Is interesting because, in such circumstances, the brain will be lacking energy because fats can not cross the blood-brain barrier to supply it. But ketone bodies can. So the brain goes straight from glucose input to ketone bodies without ever using fats.